William Napier Reeve was a Conservative, Nonconformist, London solicitor who came to Leicester in 1842 to join the firm of William Freer in New Street. He became Clerk of the Peace (1879), Clerk to the Lieutenancy, Under-Sheriff, Under-Treasurer for the County, Clerk to the Lunatic Asylum, Clerk to the Visiting Justices of the Gaol, and Deputy-Constable of the Castle. According to his obituary, he was ‘a man of more than average ability and considerable intellectual gifts,’ but the Minutes of “The Club” described him affectionately as ‘our white-haired patriarch, the smallest amongst us in body, but perhaps the largest in heart and brain’. 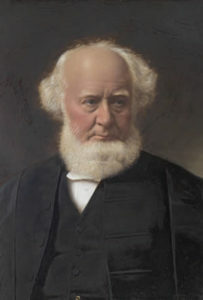 Reeve was a Fellow of the Society of Antiquaries, twice a Lit and Phil President (1854-55 and 1882-83), and a founder of two of Leicester’s Conservative Clubs. He fought for the sculpture gallery at the Museum, and supported the movement for the preservation of ancient footpaths. A man of zeal and vigour, and ‘foremost in all matters in which the heart was most affected‘, he ‘had large and broad sympathies with the people, and urged the necessity of providing for their mental and social culture as well as their physical improvement.’ W.N. Reeve was highly-cultured, a scholar, with powers of oratory, and knowledge of poetry, literature, history. The Club noted ‘his refined but enthusiastic eloquence which he knows so well how to use’ and recorded an occasion when he ‘gave a dazzling defence of the present age, its literature, its science, its moral heroism’. Source: Caroline Wessel, 2010. The Club. pp.85-96 in Exchanging Ideas Dispassionately and without Animosity (Leicester), Obituary: . W.N. Reeve, 1888. Trans. LAHS, vol. 7, pp.26-30.